Yesterday, weather forecasters issued a frost warning for the mountains, but we didn’t see any when we woke up. However, today, we awoke to a bright, crisp clear morning and a little bit of frost on the ground. 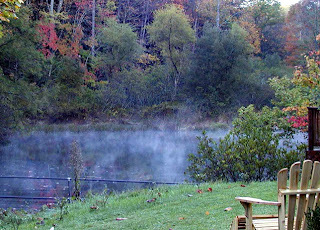 What was really eye-catching was the mist slowly rising off the lake with the autumn trees in the background. What a nice view for breakfast from the dining solarium! We’ve had several cool nights this week — if you’re planning a visit in November, be sure to bring warm clothes for the evenings and mornings. Afternoons are still perfectly pleasant and warm so layers are the best clothing option as you head out to enjoy the beautiful fall here in western North Carolina.